Fabric Buildings/ Coverall Buildings: The Future is Fabric Structures! What do fabric buildings cost and other information. What is a Coverall Building AKA a Clear Span Metal Building? A "fabric building" also referred to as a "Tension Fabric Building" is a building structure that utilizes a tension "fabric" that can withstand tension to be held in place. There are several types of tension fabrics used today: PVC coated polyester, silicon coated fiberglass, and Teflon coated fiberglass, Solawrap Film and Synergy Fabric. 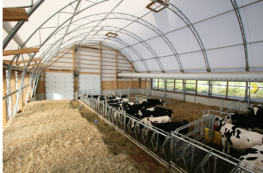 Our Britespan Building Structures are built with Solawrap Greenhouse Film or Synergy Fabric. Once the frame is built, the fabric cover is stretched over the frame. It's an innovative building solution that can be designed for all industries and meet all building needs and specifications. Global Plastic Sheeting recognized the need for a well-built clear span metal building structure that will exceed your expectations. When you are considering a fabric building in the USA, give us a call and find out why you too will see the value of a Britespan building. 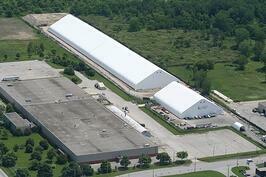 Why Choose a Fabric Building and a Distributor in the US? It's economical! Fabric covered buildings offer lower operational costs, can be installed quickly, be naturally bright, can be customized, be permanent or relocatable, and be more cost effective to build. Not all fabric building are created equal. Here's why you should understand what sets a Britespan fabric building apart. Visit it the Britespan Cover-All Fabric Building Buyers Guide Watch the video here. Translucent Properties: Britespan polyethylene fabric covers called Synergy Fabric allows natural daylight into the building, reducing/eliminating daytime lighting cost. A fabric building will require typically 1/3 of the lighting capital costs due to the bright white underside of the fabric roof reflects and disperses the artificial lighting throughout the building. 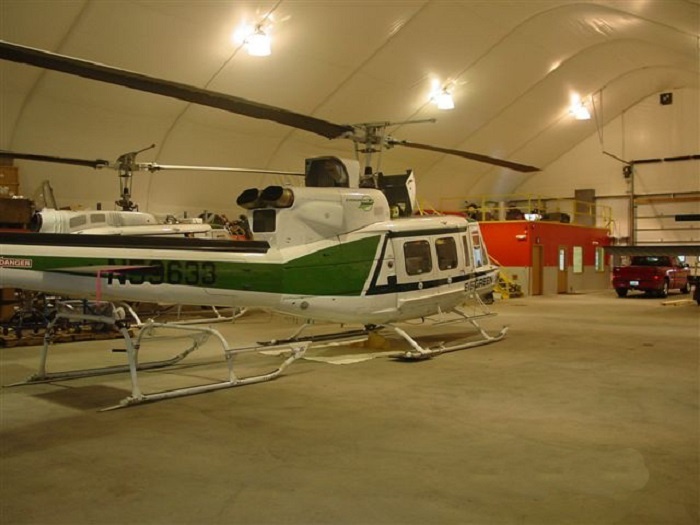 Custom Sizing: A huge advantage is the spanning capabilities of a fabric building. A Britespan Building can span 24' - 300', to any length. Britespan's Rigid Beam series also offers custom heights, widths, eaves and slopes. Be informed. Understand the differences between a Britespan fabric building and other clear span structures here. Who Uses clear span metal buildings known as fabric buildings? Hospitality buildings including banquet centers, event centers, casinos, concert halls, etc. A Fabric Building or a Steel Structure? What's the Difference? What are the various fabric structures to chose from? Where can Fabric Buildings be Built? Unlike a conventional building, a fabric building from Britespan can be constructed anywhere, including remote and temporary building sites, and are constructed in a fraction of the time as a conventional building. 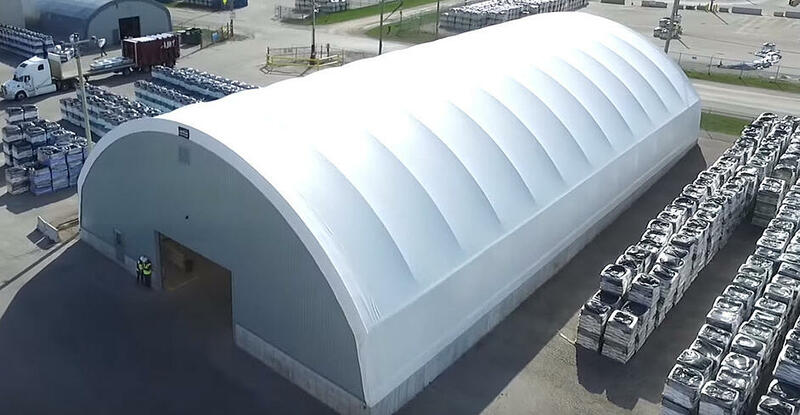 All of Britespan’s fabric structures are pre-engineered to comply with all North American and International building codes for wind and snow loads ♦ thermal factors ♦ exposure factors ♦ importance categories ♦ and enclosure categories. The best time to use a fabric building is when it will best suit your needs, when you want to save money and see a solid return on investment. How much will a Britespan Building Cost? Looking for a Britespan Dealer In the U.S.? Do you have a Fabric Structure Question?